This Labor Day weekend, celebrate the end of summer with a backyard BBQ. Labor Day pays tribute to American workers but with my menu ideas, you won’t have to work too hard. Instead, you can crack open an ice cold drink, kick back and relax with your friends and family. My Chipotle Burgers with Avocado Crema are significantly leaner than traditional burgers but are packed with flavor. Most restaurants use ground beef with a higher fat content (typically around 20% fat) to guarantee juicy burgers. I use lean ground beef (7% fat) to cut down on fat but because they’re so lean, I like to infuse my burgers with other flavorful ingredients like onion, garlic and smoky chipotles in adobo. The onion also adds moisture to the patties and keeps them juicy. I use a box grater or microplane zester to grate the onion and garlic so that they get distributed evenly throughout the meat. To complement the spicy patties, I top my burgers with a cooling avocado crema. Mexican crema is similar to sour cream but instead of sour cream, I use nonfat Greek yogurt, which has a creamy texture and tangy flavor that pairs nicely with the avocado. The healthy unsaturated fats found in avocado are a good replacement for the saturated fat found in condiments like mayonnaise. – Be careful not to overwork the meat when making the patties otherwise the burgers will be tough. – Make an indentation in the center of the patties so that they cook evenly. Otherwise the burgers will puff up in the middle. relatively high heat to get a good sear on the burgers and lock in the juices. – Once the burgers are on the grill, don’t touch them until you’re ready to flip them! Definitely don’t press down on them otherwise all of the juices will run out. – Cook about 4-5 minutes on each side and add the cheese during the last minute or two so that it melts. Remove the burgers and let them rest before serving. I also like to toast the buns lightly on the grill for a minute or two before serving. Who wants to eat a hot burger on a cold bun? My Chipotle Burgers with Avocado Crema are significantly leaner than traditional burgers but are packed with flavor. Mix the ground beef, onion, garlic, chipotles, adobo sauce, ¾ teaspoon salt and ¼ teaspoon pepper together. Be careful not to overwork the meat. Form into patties, making an indentation in the center of each burger so that they will cook evenly. Mix all of the avocado crema ingredients together in a bowl. Set aside. 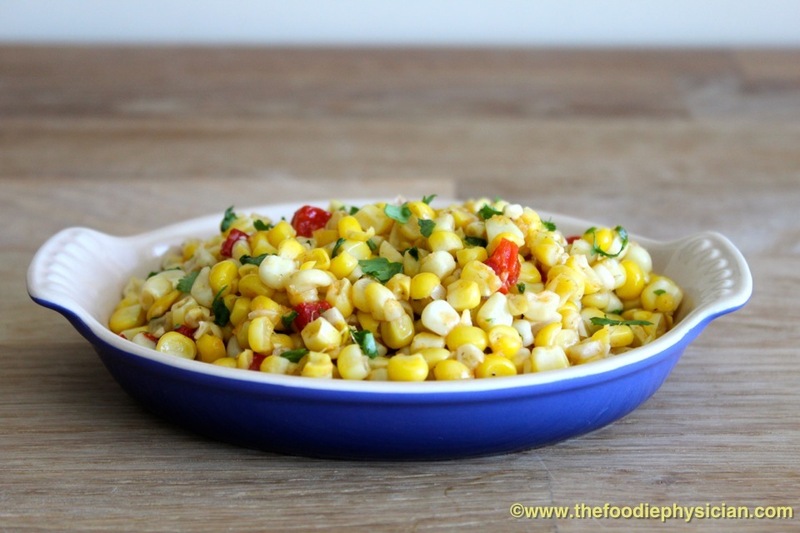 My Sautéed Summer Corn is the perfect accompaniment to the burgers and features sweet corn, a summer favorite. Heat the oil in a large skillet over medium heat. Add the garlic and cook 30 seconds until fragrant. Add the corn and cook, stirring occasionally, until cooked but still crunchy, about 6-8 minutes. Stir in the peppers, cumin and cilantro and cook another minute or two until all the ingredients are heated through. Season with salt and pepper to taste. I love the avocado crème recipe and the corn, appears simple.